Whilst Apex’s core business is the development and management of social housing, its innovative ‘Community Investment Strategy’ focuses on building stronger communities and works to support those tenants who find themselves in financial stress. One of its very successful Community Investment initiatives is its food poverty project which is based at the Apex Living Centre (ALC) in Derry-Londonderry. The ALC houses two food projects. The Foyle Foodbank deals with emergency food provision for people in crisis and the Apex Food Club, works with people living in long-term poverty, providing food and support services through a person-centred approach in an effort to support people living in financial stress. Apex is well experienced in community investment activity and has developed excellent relationships with statutory and voluntary agencies. Its projects at the ALC have been extremely successful and are subject to regular review and evaluation by The Trussell Trust (Foodbank) and the Department for Communities (Food Club). In February 2019, Apex was delighted to celebrate the first anniversary of opening the Apex Food Club. 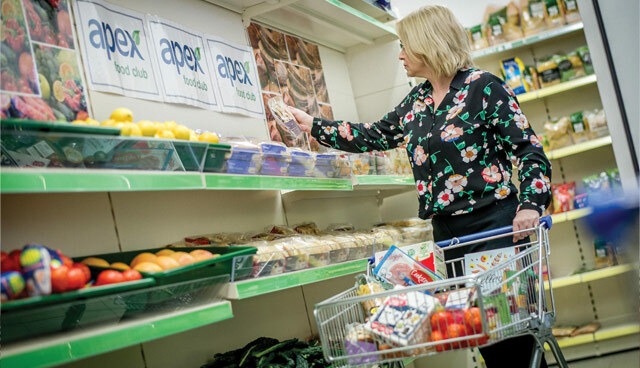 The club, which is modelled on a “social supermarket”, was an obvious and holistic extension to Apex’s already expanding work on food poverty in the North West. Since 2016, Apex has worked with local charities and business to set up Foyle Foodbank, a limited company and registered charity. The foodbank grew rapidly, and in its first year in 2016, 4,411 local people received help, highlighting the issue of food poverty in the North West. It became clear quite quickly that users of the foodbank were not interacting with volunteers and therefore the root causes of food poverty were not being addressed. The Food Club is funded by the Department for Communities from funding set aside to mitigate the effects of Welfare Reform and Universal Credit in Northern Ireland (NI). It is one of five pilots in Northern Ireland. The Food Club doesn’t solve all members’ financial problems but it certainly helps with food costs. The Food Club is different from the food bank in that it addresses the root causes of poverty by developing individual success plans for each member. Members take part in one to one advice and programmes on various issues, including: managing debt, household budgeting and food planning, employability, skills development and volunteering opportunities. Members can be employed or unemployed and must be in receipt of means tested benefits. Membership is capped at 50 so that the two staff and 18 volunteers can spend time with members. The Food Club doesn’t solve all members’ financial problems but it certainly helps with food costs. For the £5 membership fee per week, members can not only access the ‘wrap around’ services, but can also leave with a choice of food items that are worth at least £25. Membership is recommended for around six months with the aim that members, by that time, are on a journey towards better health and prosperity. While the food supply is mainly from surplus food, the Food Club also has some very generous local donors who supply a range of products including meat and bread. Local partners have also been generous with their time and resources. “I understand how difficult it can be for people to come here. But it has actually become a social hub, with a number of members volunteering at the Food Club to help support others. It’s amazing how quickly Food Club has impacted on people’s lives in terms of promoting self-confidence and self-esteem”.